The boss of the new Campos Meta 1 team has denied speculation about them lacking the funds to survive and insists they will be on the 2010 grid. Adrian Campos admitted to BBC Sport that he was looking for more money but said: "We will be at the first race." Sources say Campos is talking to South African businessman Tony Teixeira about taking a shareholding in the team. "We are talking with people who would like to be shareholders," added Campos. "We expect to have more investors." Campos, who has set up the team in partnership with Spanish businessman Jose Ramon Carabante, was responding to widespread rumours in F1 circles that the team was on the verge of collapse. "People speak too much and make trouble for us," he stated. "I don't want to sell my part of the team and I will remain the team principal - the condition to be a shareholder is to accept all the existing contracts. "We are looking for investors and sponsors but the project is very much alive." Who do you think will field the best car for this season and why? Campos added that with the money provided by F1 boss Bernie Ecclestone's Formula 1 Management company and the funds that will be provided by a yet to be confirmed second driver, "we are very near a budget". Italian race-car constructor Dallara, which is building the Campos car, confirmed to BBC Sport that the team was up to date with its payments. "It is not true, not from our side at least [that Campos are behind on payments]," said Dallara chief executive officer Andrea Pontremoli. "We are still proceeding to build the car and it has passed its crash tests." Campos said he expected the car to run for the first time at the third of the four F1 pre-season tests on 17-20 February. One source told BBC Sport that Campos had come to a deal in principle to sell a major shareholding to Teixeira, who was to spend this week completing due diligence on the team. Campos, a former F1 driver, would not confirm that he was talking to Teixeira but said: "People speak about Teixeiria, but we are talking to others [as well]." Teixeira is the former boss of the now defunct A1 Grand Prix series and was linked last winter to a buy-out of the former Honda team that became Brawn and went on to win the world championship in 2009. Sources say another option for Campos would be to sell to Serbian Zoran Stefanovich, who is trying to set up a team called Stefan Grand Prix. This option, though, would involve Stefanovich buying Campos's entry but not using any of the other contracts - including Dallara. Stefanovich is reported to have secured an agreement to use the car that the former Toyota team designed and built in preparation for 2010, following the Japanese manufacturer's decision to quit F1 at the end of last season. Campos said that the team-mate for Bruno Senna, the nephew of the late F1 legend Ayrton, would be another novice driver. Campos admitted he was in talks with former GP2 drivers Vitaly Petrov of Russia and Venezuelan Pastor Maldonado but said there was a third driver in the running, who he would not name. Another of the four new teams, the American outfit US F1, is also the subject of speculation. Sources close to the team say it is touch and go whether they will be ready for the first race but their boss Peter Windsor insisted to BBC Sport that they, too, were on target for the start of the campaign in Bahrain on 14 March. "Given when we started up - in August - it is unbelievable what we have achieved," said Windsor, who denied a story in Sunday's Gazzetta dello Sport that the team had asked to defer their debut until the fifth race of the season, the Spanish Grand Prix. "Just to be where we are with the building is incredible but to be as far advanced as we are with the car and the rest of our business plan is fantastic. "We're not doing this to support F1 but I think F1 will be very happy when they see what we can bring to the sport." Among US F1's backers is Chad Hurley, the boss of video sharing website YouTube. 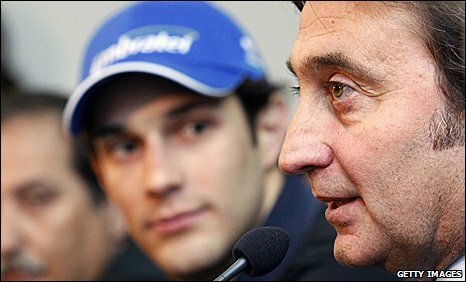 They are understood to be close to signing the Argentine ex-Formula 3000 driver Jose Maria Lopez, who was recommended to Windsor by F1 legend Carlos Reutemann, now a powerful politician in his home country. Lopez is believed to have the backing of the Argentine government in his bid to be an F1 driver. The identity of the man in line to be their second race driver and reserve driver is not yet known. Windsor and his partner and fellow team boss Ken Anderson are keen to bring American talent into F1. The last American F1 driver was Scott Speed, who was sacked by Toro Rosso in 2007. The last American to win a grand prix was the 1978 world champion Mario Andretti.